P is for Pirates, Pizza, Pancakes and Penguins! P week was way fun. Seriously. There are way too many P words to choose from. Here is a list of words that we encountered and at least talked about this week: prophet, potty (um both kinds… TMI? ), pancakes, pizza, penguin, pig, pirate, Peter Pan, pup, perro, pulpo, Pearl, purple (still Isaac’s favorite color), pelota, princess, pea, pajamas, planes, película and pumpkins. We started off the Thursday before General Conference coloring pictures of the prophet, President Monson, and getting excited about listening to him speak over the weekend. I printed out activity packets from here. I was a little anxious about General Conference with three toddlers because I really wanted to be able to listen to some of it but I was fully aware that 8 hours of sitting in front of a tv screen was unrealistic for those guys. Luckily, two of the four sessions coincided at least partially with nap-time so I focused on the two morning sessions. We put away all their noisy toys and pulled out books, puzzles and coloring packets for them to play with during conference. I also tried the whole listen-for-a-word-and-get-a-snack-when-you-hear-it game. Isaac got pretty good at it. The twins just got a treat whenever Isaac did. They were still pretty clueless. I really didn’t spend a whole lot of time preparing anything (and definitely didn’t make it cutesy….well okay the packet was kinda cutesy but all I did was print it!) but mission accomplished! I got to listen to a good chunk of the talks AND the boys were able to enjoy it as well. I feel like they came away knowing who the prophet is and that it’s important to take time to listen to him. If you didn’t get a chance to hear it, all of the talks are available already on lds.org. My favorites were The Moral Force of Women by Elder Christofferson, To My Grandchildren by President Eyring and No Other Gods by Elder Oaks. Although Power in the Priesthood by Elder Anderson and We Never Walk Alone by President Monson were awesome too. There’s too many to pick. Just go read them all! We also read books about penguins, pirates, pizza and pancakes. Isaac’s favorite (in English and Spanish) was If You Give a Pig a Pancake. I thought the Princess and the Pizza was cute and El Pingüino Taky. Cooper loved Splash! A Penguin Counting Book. (The twins’ “counting” is so stinking cute). Carter liked Penguin Pete (although I thought it was just meh). The overall favorite was All by Myself! They all fought over it. Who knew the one potty book I brought home would be such a hit?? 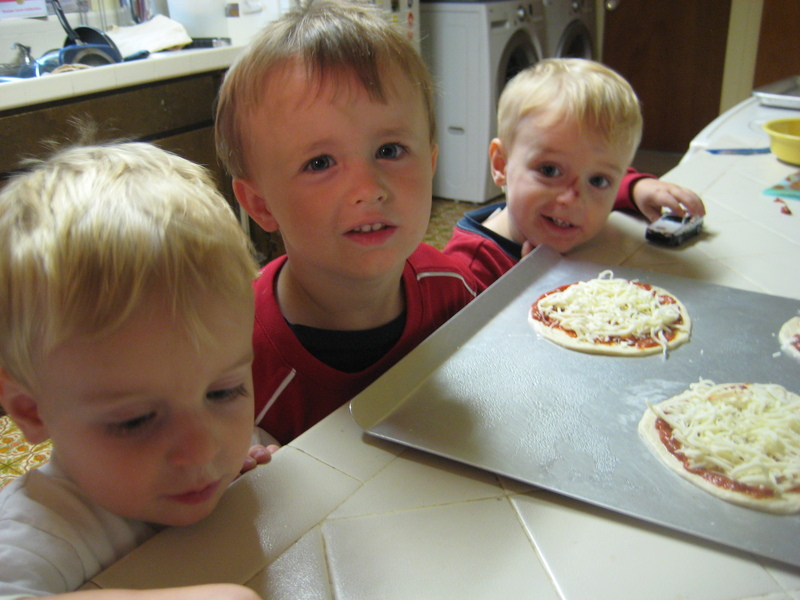 We made our own little pizzas out of Rhodes roll dough. Should have made more. The boys were sad when they were gone. We ate pancakes more than once. We picked out pumpkins at Grandpa Curtis’s house. Our last P activity for the week was while Daddy was gone playing soccer. The boys and I popped popcorn and watched Peter Pan in our pajamas. So many P words in one sitting! It was really fun.